A dense fog advisory is in effect until 10 a.m. for much of the ABC11 viewing area. Click here for First Alert Doppler XP Click here to view the latest weather advisories. Click here to download the ABC11 First Alert Weather app. The thick fog could slow down the morning commute, so drivers should use caution and count on extra time in traffic. 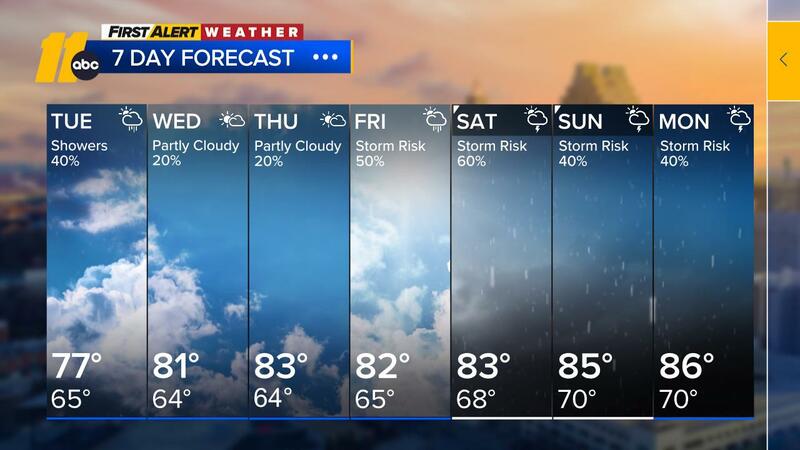 ABC11 Meteorologist Liz Horton says there will be a bit more moisture in the area than yesterday, so we could see a few patches of drizzle this morning, followed by a few scattered storms this afternoon. The best chances for rain will be south and east of the Triangle. "The influx of moisture will continue on Wednesday, as a cold front approaches the area," she said. "Thunderstorms can be expected in the moisture-rich environment, especially in the afternoon." Horton says Thursday will be the wettest day of the week, with numerous showers and storms, as the front moves in and stalls out for a time.